Four-year-old Marcela and her mother, Judy, live with Marcela’s doting grandparents, an aunt and two uncles in the city of Oruro, Bolivia. Judy divorced Marcela’s father, Raul, after a short and tumultuous marriage. Since then, Raul is no longer part of their lives. Judy earns a decent income as a dentist, and along with her family’s support, she has been able to give her daughter a stable and happy upbringing. But Judy was not prepared to pay the cost to correct Marcela’s congenital heart defect. 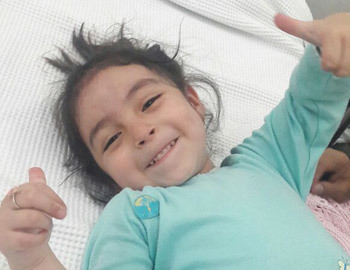 As the doctors explained, the wall that divides the two sides of Marcela’s heart had failed to fully form, and she needed either open heart surgery or a new procedure, known as a cardiac catheterization, to fix it. Judy evaluated the two options before opting for the less-invasive catheterization. Marcela was then approved for participation in a week-long campaign to provide cardiac catheterization procedures at the Incor Hospital in Santa Cruz, facilitated by Puente de Solidaridad and Dharma Social Projects. As she tells the story: We didn’t know what help there is for this type of heart problem … I am very happy and grateful with the help you are providing so that children can undergo this procedure, and it not be so traumatic for them. Judy traveled alone with Marcela to Santa Cruz for the procedure, and was especially grateful for how well she and her daughter were cared for throughout Marcela’s hospitalization: Many thanks for all your support and for the human warmth with which you all work!